Current ITV drama Talk to Me, Danny Brocklehurst's steamy series about a philandering late-night phone-in radio DJ (Bodies' Max Beesley), is being released on DVD on July the 9th. The four-part series also features Casino Royale's Joseph Milson, Beesley's Hotel Babylon co-star Emma Pierson, Sean of the Dead's Kate Ashfield, and Neverwhere's Laura Fraser. The episodes will be presented in their original 16:9 (1.78:1) format, with Dolby Digital 2.0 stereo audio. The RRP is £19.99. Digital Classics' release of British satirical comedy The Rise and Rise of Michael Rimmer, which is due on sale next week, will feature a director's commentary track, a picture gallery and an original film poster. The film stars Peter Cook, alongside comedy greats John Cleese and Graham Chapman. Liberation Entertainment will release Alberto Negrin's Mussolini and I on DVD on August the 6th. The film stars Bob Hoskins as the man they called 'Il Duce'. Lion's Gate Home Entertainment has two new DVD releases for August the 6th: political thriller Slow Burn and Bruce Beresford's hit-man action pic The Contract. Slow Burn, which stars Ray Liotta, LL Cool J, Chiwetel Ejiofor, Mekhi Phifer, Taye Diggs and Star Trek: Enterprise's Jolene Blalock. The Contract stars John Cusack, as a hiker who gets tangled up with paid assassins, and a mysterious man, played by Morgan Freeman. Both films will be presented in "16:9 widescreen" format, with Dolby Digital 5.1 audio and optional English subtitles. Both discs have an RRP of £15.99. I've been able to verify that The Anniversary is definitely due from Optimum on July the 9th, but not much more than that. Apparently the title is such a low priority for the label that there's not even a press release for it! The RRP is £12.99. 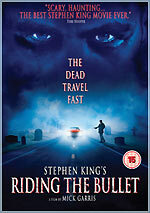 Metrodome will release Stephen King's Riding The Bullet on DVD on August the 6th. The film is directed by Masters of Horror creator Mick Garris (who's crossed paths with King material before, with Desperation, The Shining, The Stand and Sleepwalkers. The film, which stars Jonathan Jackson, Erika Christensen, Cliff Robertson, Barbara Hershey and David Arquette, will feature 5.1 audio, a featurette called Shooting The Bullet and a commentary by Mick Garris. No other technical details were released. Lionsgate has delayed the release of Weeds - Season 1 (again). It will now be released on September the 3rd. For more information, check out the series' Incoming entry. A couple of etailers have Bette Davis' The Anniversary listed for release on July the 7th, from Optimum. I'll add more information when I have it. In the meantime, here's the disc's Incoming record, where you can see the sleeve art. The film's Hammer DVD Guide entry has been updated accordingly.